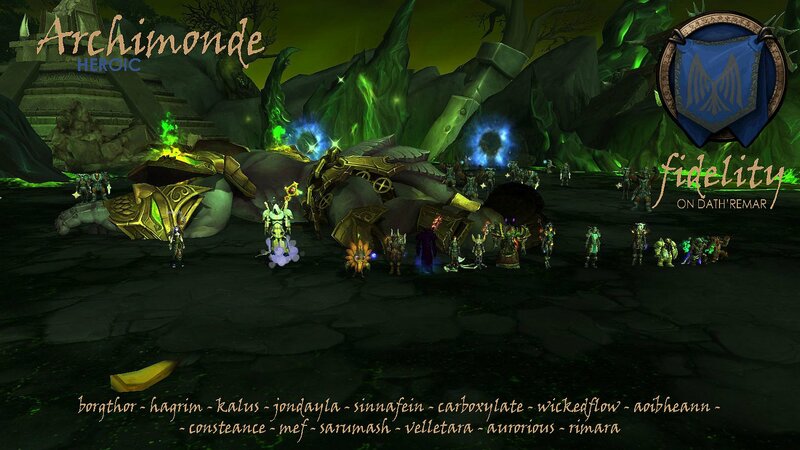 Heroic Archimonde was certainly a challenge for a small raid group. On nights where we had 10 or 11 raiders, it felt like we were banging our heads against a brick wall. It seems a shame that after a full expansion of flexible raiding, that the scaling is still so hit and miss, from boss to boss. We persevered. For the first phases, we employed the ping pong strategy, moving the whole raid after each time Allure of Flames was cast. Getting people to reliably spread for Shadowfel Burst without spreading out excessively was a challenge, and stacking on the flare afterwards was worse. We organised the raid into a melee group and one with ranged and healers (so our stack point flares made a nice rectangle). For Wrought Chaos, we had both the target and wrought players move into the channel between the flares where noone should be standing. Timing the Shackled Torments breaking took some finesse, but if people were on the ball, was usually managed well. The difference in raid size was felt pretty dramatically even in the first phases. We were using three healers, and as we got the 12th, 13th or even a luxurious 14th person in the raid, the adds died soooo much quicker, and the first phases became a lot smoother as well. In the last phase, our strategy was built around trying to get as much uninterrupted time on the boss after the second Nether Banish as possible. Our first Nether Banish group was reasonably small. Our second Nether Banish group was a big as possible, and designed to nuke the add and get out. Ideally, when the second group was out, the boss was super close to 26% and could immediately be pushed over and Rain of Chaos would begin. On our cleanest attempts, the 3 Internals would be grouped and nuked with the legendary DPS ring explosion, and we would have a lot of time with Heroism up, nuking the boss before the 3rd Nether Banish . If done well, Archimonde’s death almost seemed inevitable as the 3rd Nether Banish group went in. If not, it felt as if we’d barely put a dent in Archimonde before the next banish and things started to deteriorate from there. The last phase requires everyone to spread out 6 yards for Demonic Feedback. The timing in relation to the 2nd Nether Banish would often cause serious havoc as it was a real struggle to spread out that quickly after coming out of the portal, with unleashed torments going off, wrought chaos shenanigans and an imminent Rain of Chaos. Oh yeah, we had hunters kill the Living Shadows. Super important to mention their crucial role. We would ignore the second set of Infernals (by ignore I mean crowd control or stun them), and if needed send a sacrificial 4th Nether Banish group to die while we finished off the boss. The two biggest issues (aside from just enough throughput to kill the boss) in the last phase were range issues as people spread out too far to avoid standing on each other and people dropping the ball on getting into the Nether Banish. So finally, on first raid night of our last raid week before our holiday break we had a full 14 raiders. We kept to three healers to maximise our damage throughput in the last phase, and Archimonde fell. 113 attempts. Dead. 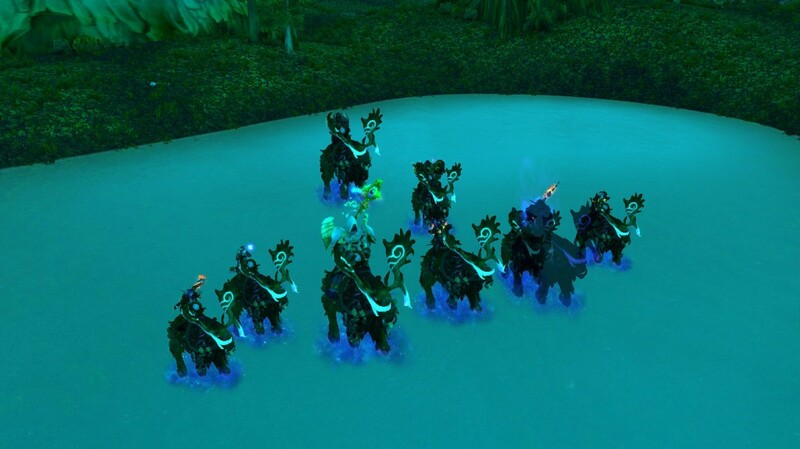 Demonstrating why the screenshot boss is the hardest boss… here’s some of us on our Moose mounts.